An interesting article in Nature last year, by scientist and journalist Anita Makri, described how science communicated in the popular media sometimes leaves the public confused, and that in the ‘post-truth’ world, scientists are increasingly being ignored. Makri criticised what’s known as the ‘deficit model’ of the public understanding of science concluding that it’s partly scientists’ fault that they are being ignored. The message is clear. Scientists need to be less technical and perhaps even a bit more humble when putting over their messages. Over the last year at the BGS, we’ve been putting this theory into practice communicating our major UK Geoenergy Observatories investment to the public – with some success. Anita’s Makri’s article makes an interesting distinction between the blue-sky, ‘sense-of-wonder’ science of Brian Cox and David Attenborough, and applied socially-relevant, ‘incremental’ science, suggesting that the latter is the more difficult to communicate. BGS science sits firmly in the socially-relevant category. Though we have grown out of a science rich in wonder (fossils, ancient climate change and mass extinctions), BGS concentrates on ‘lives and livelihoods’. Our strategy of sensing the Earth is about understanding the subsurface at timescales that matter to people, rather than over millions of years. This is exactly the science of UK Geoenergy Observatories – infrastructure designed to look at the possibilities of using the subsurface for decarbonisation technology. I have to admit that as a scientist with a role in communicating geoscience issues, I have sometimes got it wrong. A few years ago, a YouTube cartoon was made of a talk on shale gas that I gave at a London debate. The filmmaker shortened and simplified my argument (that science needs to take a greater role in the debate). I liked the cartoon, and so was surprised by some of the online reaction, which described the delivery as a bit arrogant and stuffy. 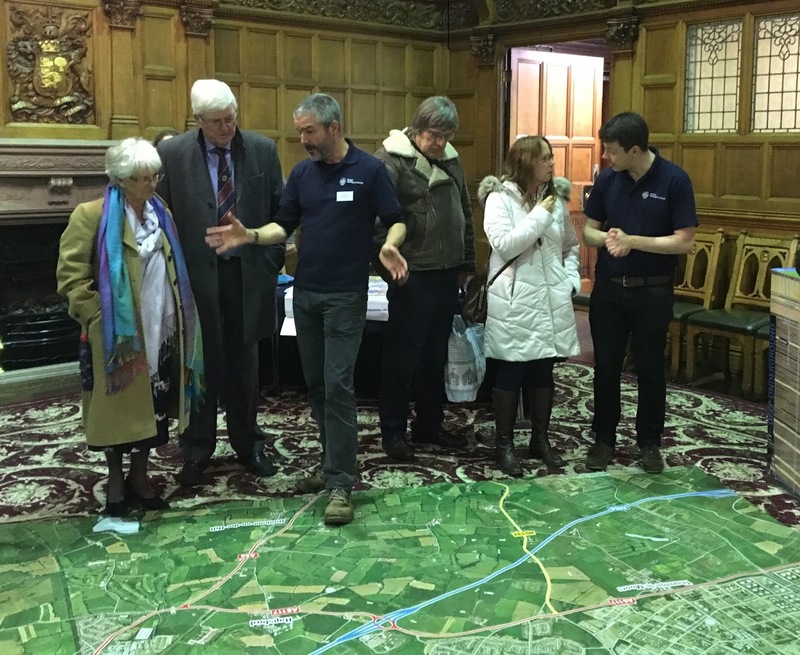 So when the UK Geoenergy Observatories project came along – with all its challenges for communication – it presented an opportunity for a new approach. This is part of a sustained BGS communications campaign, planned and led brilliantly by UK Geoenergy Observatories communications manager Cristina Chapman. The UK Geoenergy Observatories are BGS and NERC’s new geoscience test sites being set up in Glasgow and Cheshire. The sites will watch and analyse the underground, and develop technologies that might help the UK to decarbonise. Our new observatories will look down into the Earth just as Jodrell Bank and Herstmonceux look up into the sky. Developing the science, designing the arrays of boreholes and specifying the sensing devices has been an absolute focus of our activity to take the idea from concept to reality. 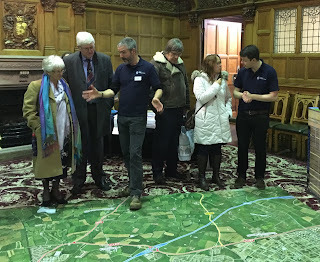 So too has been the importance of meeting local people in Glasgow and Cheshire to explain what our observatories will do and why we are so excited about the science. Reaching out to local people meant meeting them on their terms. 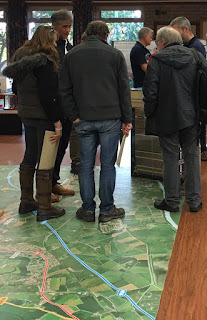 We made sure that the approach was neither didactic nor pedagogic and that we were in listening mode at all times. We turned up in church halls and community centres right at the heart of the communities that would be closest to our boreholes. We turned up at times that allowed for different working patterns and daily routines. The communications team stripped away the usual academic props (orating experts, lecterns, projectors, rows of chairs and jam-packed agendas), replacing them with open space drop-in sessions, free-flowing dialogue with BGS scientists ready to listen – and lots of pictures, maps and physical props. We fielded representatives from all areas of the organisation: generalists, specialists, delivery staff - and from the very top of the organisation. Everyone pitched in and everyone played a part – which helped to break down ‘them and us’ barriers. The ‘drop-in and meet the scientist’ events I attended were among the most interesting experiences of my 17 years at BGS. It was intellectually taxing and physically demanding work, and probably some of the most rewarding work I’ve done in years. Others found it similarly rewarding. For a government scientist, there can be no better test of your ‘function’ - to be able to say convincingly what your science is for, how it benefits the country and whether it represents taxpayers’ money well spent. BGS has gone some way to understanding the challenges of communicating science but there is much more we can do. One thing is certain: when we make the time to listen, people return the respect by taking time to engage with us. It is this two-way dialogue that makes our science more relevant and our communication more efficient. In June 2018, scientists interested in the study of mud found at the bottom of lakes met for the first joint meeting of the International Paleolimnology Association and International Association of Limnogeology (IPA-IAL) at Stockholm University in Sweden to “unravel the past and future of lakes”. Considering lakes are important sources of freshwater, stores and sinks of carbon and provide us with a wealth of other services, the more we can understand about these incredible ecosystems will ultimately help us to protect them from environmental degradation. Studying the sediment found at the bottom of lakes which builds up over time allows us the ability to investigate how the lake and its surrounding landscape has changed from the past to the present. This can then help us to predict what may then happen in the future. 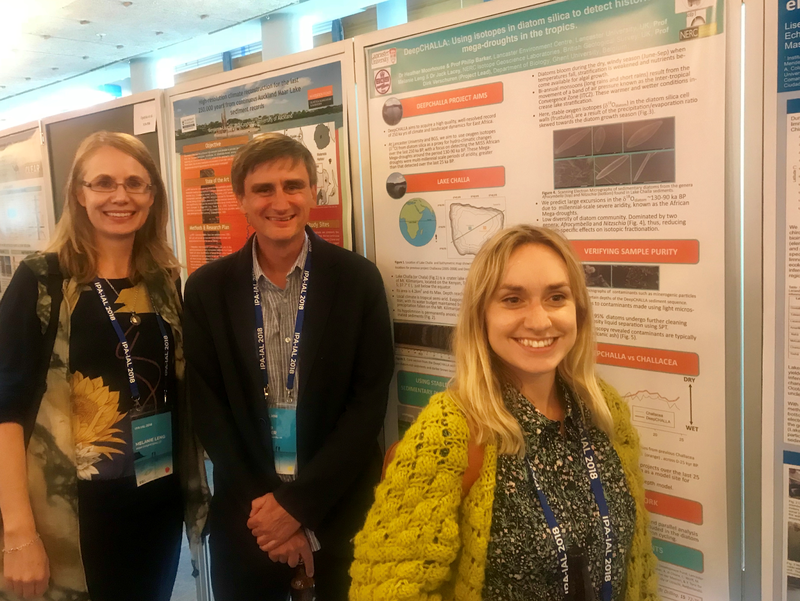 The IPA-IAL meeting was a chance for researchers around the globe to discuss progresses made in using lake sediments to understand human impacts, climate change, landscape and ecological evolution and natural hazards. Scientists working on the International Continental scientific Drilling Programme (ICDP) led project DeepCHALLA (see my previous blogs!) were present at IPA-IAL to update other leading researchers on our investigations of ~250,000 years of environmental change in equatorial east Africa. We are using sediments retrieved from the bottom of Lake Chala, which is found directly on the Kenyan, Tanzanian border. Inka Meyer from Ghent, Belgium presented work on how we can use the grain size and mineralogical composition of the terrestrial (land-based) components of the sediment. This can help us to understand whether wind or run-off was delivering this material to Lake Chala and so, tells us about the changing climate and landscape. Maarten van Daele also from Ghent, Belgium discussed how turbidites or sediment disturbances can deliver material from shallower depths to deeper depths. Often this material contains fossils such as fish teeth, and invertebrates that aren’t normally deposited at deeper depths where sediment cores are usually taken. This has the potential to help us understand changes to these ecological communities more thoroughly. Aihemaiti Maitituerdi from Haifa, Israel presented methods on investigating the geophysical record to understand changes to the lake level at Chala, which can help understand changes to past hydrology and climate. Finally, I presented a poster on our work at BGS and Lancaster University, which is looking at the biogeochemistry of phytoplankton in the sediments of Chala to see if we can identify and constrain the African Megadroughts thought to have occurred 130 to 90 thousand years before present. These Megadroughts were periods of severe aridity lasting thousands of years and are believed to be important in the evolution and dispersal of our hominin ancestors from the region. Those working on DeepCHALLA look forward to continuing the exciting discussions and future work that was presented at IPA-IAL. No conference studying things under water is complete without a boat trip. Some delegates elected a cruise around the Swedish archipelago and learnt about islands named after each day of the week according to when the farmers would row their livestock to each island to let them graze. The conference dinner featured a surreal evening of entertainment, with musical tributes to the nations sweethearts: ABBA. Thanks to the conference organisers and committees of IPA and IAL for hosting a fantastic meeting. The protection of tropical wetlands including below ground peats is a key internationally agreed strategy in reducing CO2 emissions from deforestation and land use change and therefore slowing climate change. Whilst numerous estimates of carbon stores exist, they often only focus on carbon close to the soil surface (0 to 0.5 m) or from mangrove swamps and seagrass meadows (Blue Carbon) environments. Consequently, surprisingly little is known about the carbon accumulating at depth (0 to 10 m) below tropical forests and particularly those in Central America. 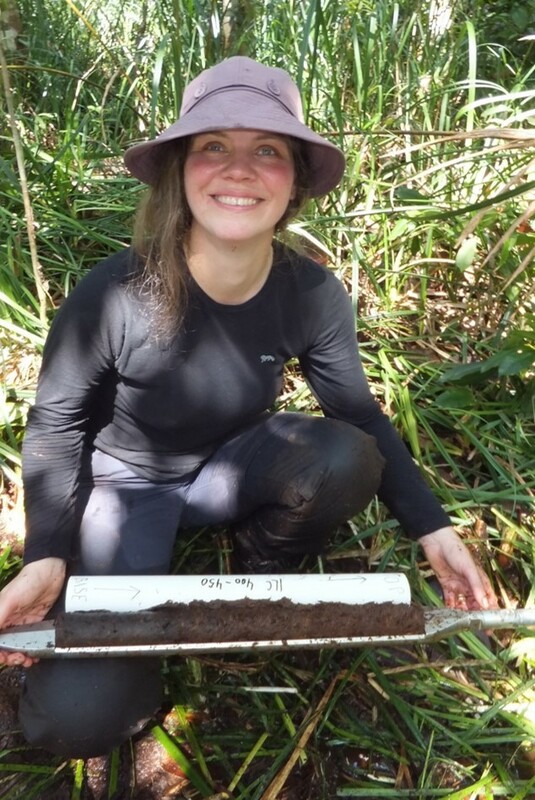 A joint team of scientists led by Chris Vane (BGS) and Sofie Sjogersten (University of Nottingham, Biosciences) took on this challenge and undertook a pilot coring campaign in the extensive San San Pond Sak tropical peatland situated in Bocas del Toro, NE Panama. 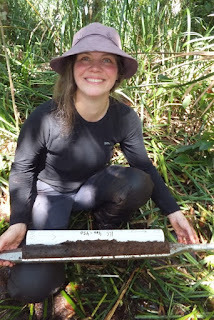 Coring in pristine freshwater swamp forest requires a high tolerance for biting insects, a keen eye to avoid the occasional snake and a good sense of direction to avoid getting lost. Nevertheless, the team cut a trail with the help of a local guide and hand-cored a lateral sequence spanning five vegetation zones. Upon return to the Organic Geochemistry team including visiting University of Nottingham MSci student Abbie Upton measured the carbon stored in each vegetation zone and assessed changes in organic matter input and decomposition rates down profile using Rock-Eval (6) pyrolysis, lipid compound distributions and infrared spectroscopy. Usually coastal mangroves are cited as among the most carbon-rich forests in the tropics with values around 1,023 Mg carbon per hectare (Mg ha-1) however we found that mixed swamp forest (1884 Mg ha-1), Camponsperma forest (1695 Mg ha-1) were even richer and that carbon accumulation increases with burial time/depth because selective decomposition of carbohydrates by bacteria effectively increases the proportion of polymerised aromatic structures as the peat mature sand stabilises. The findings of this research have just been published in the Journal Geoderma. Large infrastructure projects regularly over-run due to unforeseen ground-conditions, so in order to minimise the project risk, desk studies and site investigations are carried out which often include drilling boreholes. 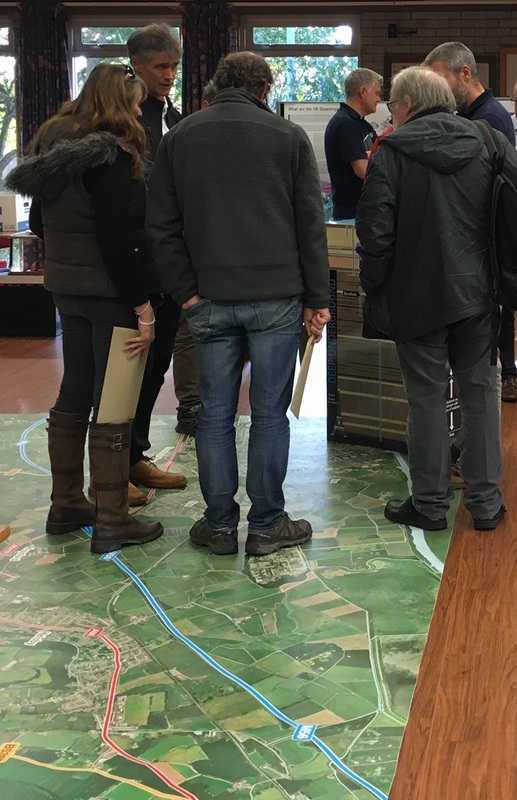 But boreholes are expensive and time consuming to drill, around £4000 for a 20m deep borehole, so consultants try and gather as much historic information about the site as possible before planning their site investigation works. BGS operates the National Geoscience Data Centre (NGDC) which collects and preserves geoscientific data and information, and makes them available to a wide range of users. 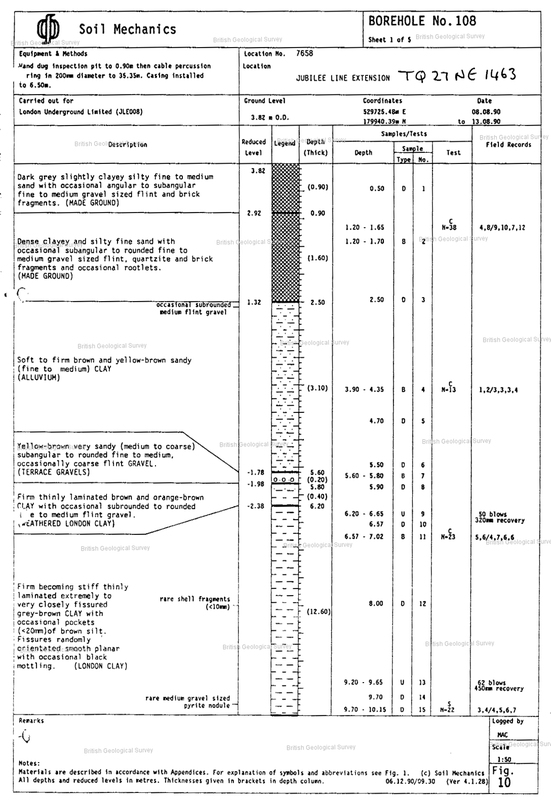 Borehole records are just one type of data that the NGDC collects from third parties. 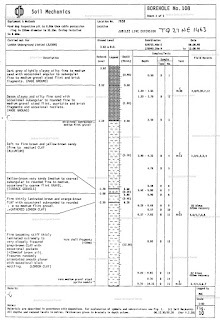 In 2010 BGS scanned its collection of legacy borehole records and released them as open data on its OpenGeoscience website. The impact has been staggering. Overnight, the number of borehole records accessed went from 2,000 a month to 20,000. By the end of the first year, 300,000 records had been downloaded; a significant increase on the 17,000 from the previous 12 months. This has steadily grown over the last 7 years, and in 2017 we logged over 2.5 million downloads. 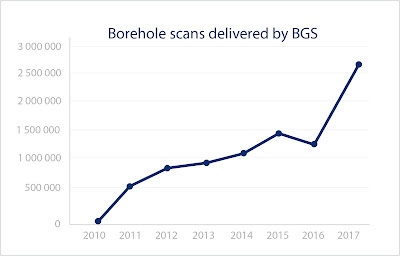 This incredible increase was stimulated by BGS' commitment to pushing the borehole records out as widely as possible including via its data partner network and through the BGS iGeology smartphone app. But it’s not just the number of hits that’s impressive, but the virtuous cycle that this triggered. 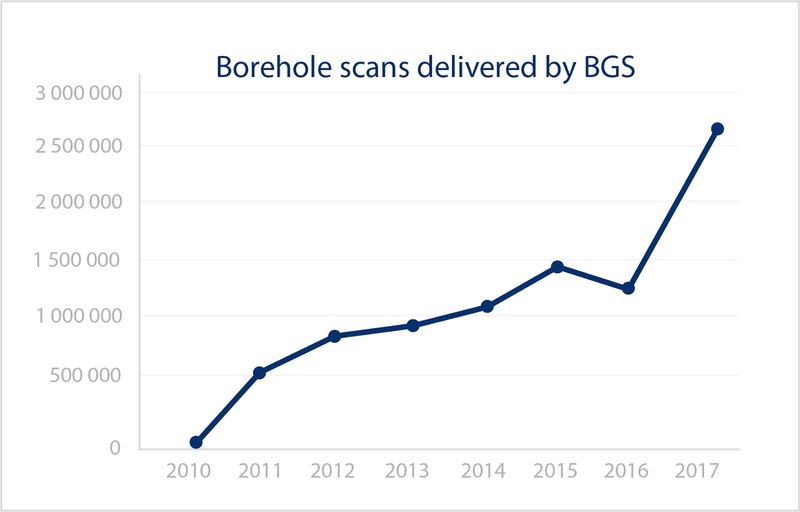 As more people access the borehole records, more clients and contractors see the benefit that data sharing brings to the wider industry, and start to donate their own borehole records to BGS. This means more borehole data is accessible, triggering greater uptake, and so the cycle continues. Unsurprisingly BGS has made many friends by investing in the borehole data release who are keen to collaborate to extend this principle further. We have just started a project with Atkins and Morgan Sindall to encourage a community around further opening of geotechnical data, in particular data in digital AGS format, and the creation of a simple to use and sustainable workflow. As there is no legal obligation to deposit site investigation records, BGS has to rely on good will by the depositor and importantly need the client’s permission so a lot of the work will focus on communication and education around the process. We hope this approach will release and unlock the estimated 80% of site investigation data that are still hidden within the geotechnical industry leading to a major shift in the availability of borehole data for the benefit of all. The success of any data sharing initiative is down to those who are willing to buy into the process and commit their own data. This takes time and resources, and so we are grateful to all who have donated their information in the past and continue to do so today. By working together to achieve a common goal, we have been able to save potentially millions of pounds in unnecessary site investigation costs. 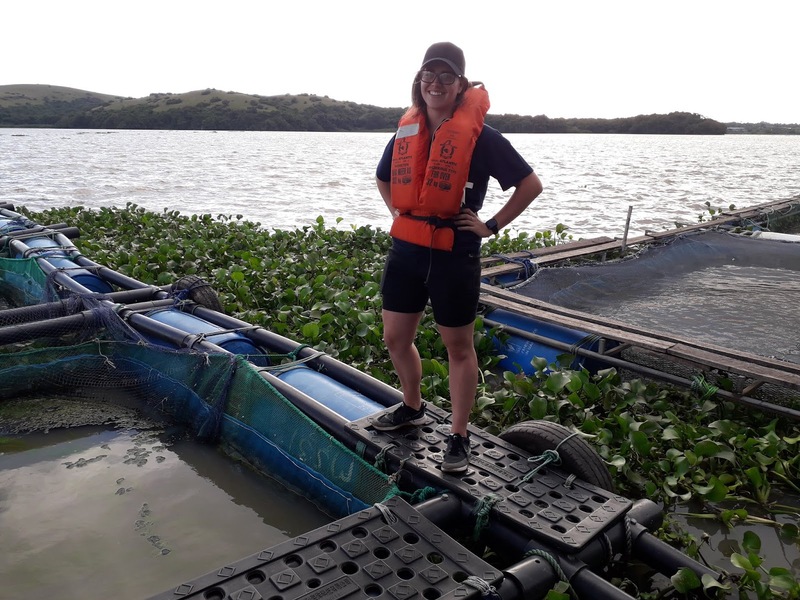 Kelsey standing on floating Tilapia cages on Lake Victoria, Kenya. My name is Kelsey Ferris, a Biotechnology student from the University of Waikato, New Zealand. I am half way through my one-year placement with the British Geological Survey, working in the Inorganic Geochemistry Laboratories in Keyworth, Nottingham. 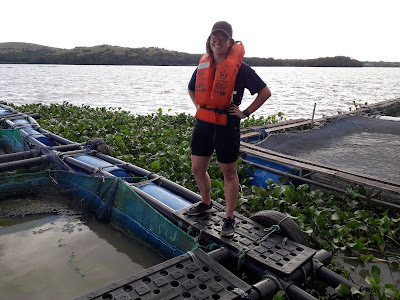 I have been supporting Dr Andy Marriott in his project - Aquaculture: Pathway to food security in Kenya, looking at the link between anthropogenic pollution in Lake Victoria and the geochemical content in caged and wild fish, sediments and lake water. We are investigating the impact this has on health and nutritional quality of aquaculture farmed fish, and the potential of aquaculture to strengthen food security and sustainability for the region. My main role as an analyst in this project is to test the total mercury content of sediments and wild and caged fish tissue, and the water quality parameters taken from key locations in the Winam Gulf of Lake Victoria. Andy and I partnered with Dr Tracey Coffey from the School of Veterinary Science (University of Nottingham), Professor Odipo Osano from the School of Environmental Sciences (University of Eldoret) and key stakeholders in Kenya’s aquaculture industry, including an excellent research team from the Kenyan Marine Fisheries Research Institution (KMFRI) led by Dr Chris Aura and local aquaculture cage owners. I was lucky enough to be a part of the fieldwork aspect of the project, and have recently returned from a 10 day trip to Kenya for sampling. We spent 3 days and nights on the largest tropical lake in the world, surrounded by locals in their traditional canoes and floating plant islands which are home to monitor lizards, birds and even hippos. Whilst on board the KMFRI research vessel R.V. 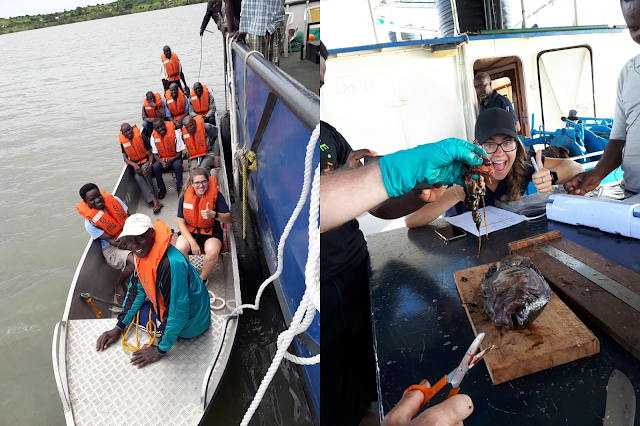 Uvumbuzi, we conducted transects of Lake Victoria to be sampled for waters, sediments, and wild and caged Tilapia. Visual examination of the waters highlighted possible causes of pollution into the lake indicated by their colouration, which ranged from a vivid green (algal blooms) close to the city of Kisumu and also Siaya County (where intensive cage culture was observed), brown water rich in particulates throughout Winam Gulf, and clear water as we entered the main Lake Victoria basin. This trend was consistent with the strong H2S aroma from sediment samples, an early indication of possible eutrophic conditions due to human interactions. One of my tasks was collecting and filtering water for elemental analysis by ICP-MS and anions by Ion Chromatography in the Inorganic Geochemistry labs, so it was a relief to enter the clear waters so that my thumb could have a rest from the filtering. Assisting in the subsampling of caged Tilapia fish tissue. As a placement student I have travelled all the way from the University of Waikato to work at The British Geological Survey, and have now had the chance to do fieldwork on Lake Victoria and at the University of Eldoret. The student programme that BGS offers is extremely beneficial because of the combination of routine analytical testing and hands-on fieldwork, which contributes to important real-world research projects. My placement has been very valuable to my studies, allowing me to apply my theoretical knowledge into a practical work environment, and strengthen my initiative and drive to contribute to the scientific community. From wearing a lab coat to a life jacket, you never know where a science degree may take you! The UK is a member of the ICDP and this enables consortiums of geoscientists from the UK (in collaboration with other member countries) to apply for funding to drill deep holes into the Earth through many kilometres of sediments and rocks in order to get cores of pristine material for scientific study. There are many reasons we want to take long cores through the Earth and like many applications we assessed in China, they often involve assessing natural hazards including volcanos and earthquakes, natural resources and understanding palaeoclimate. Both workshop proposals and full drilling proposals were assessed at the meeting in China and the outcomes will be published on the ICDP website in the coming weeks. The UK has a past history of successfully obtaining ICDP funding. 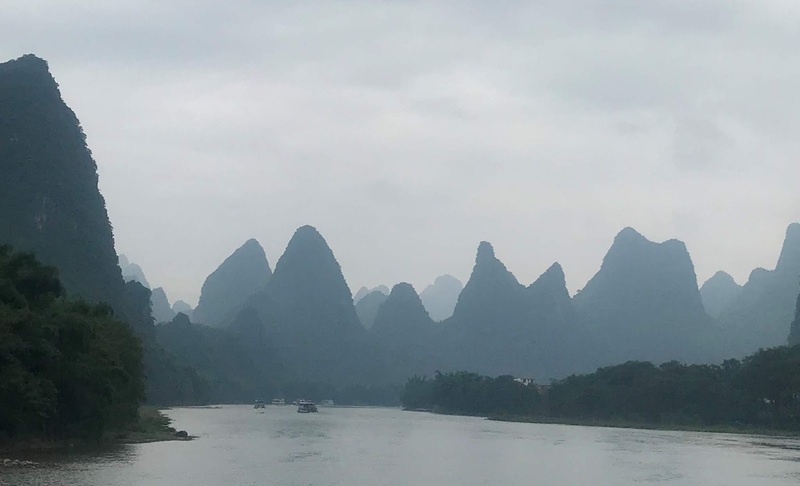 As part of the meeting (and a rest day after 3 days around a conference table) the ICDP committee also visited the Lijiang River (the Guilin state “AAAAA tourist attraction” and one of the most famous tourist regions in China). The Lijiang river travels hundreds of kilometres passing through a karst region around Guilin where the “jade ribbon winds through thousands of grotesque peaks”. The reported 2,600m of Devonian and Carboniferous limestones, that form the karst terrain within the Guilin Basin, gives the area its dramatic landscape which formed over the past 10-20 million years. The limestone towers have near vertical sides ranging from tens to hundreds of meters in height. The towers have evolved by slow and continuous tectonic uplift of the karst along with slow rates of erosion. Our visit along the Lijiang River by boat was quite spectacular. The tourist cruiser (twisting and turning along the river amongst the beautiful scenery) was very peaceful despite the hundreds of boats and tourists (this is one of China’s top tourist destinations)! It rained for most of the time we were on the river although that did not detract from the wondrous landscape. Back to ICDP, the UK has key personnel within the program. 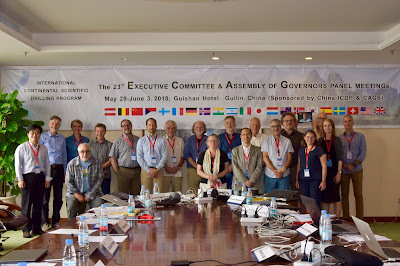 Lizzie Garratt (NERC) currently sits on the assembly of Governors, I sit on the Executive Committee and Dr Kathryn Goodenough (BGS) is the Chair of the Science Advisory Group. Please feel free to contact us about ICDP activities. The next deadline for ICDP drilling and workshop proposals is January 2019. You can also keep up to date with ICDP-UK through our website. This weekend, it will be 25 years since the Holbeck Hall landslide and, while searching through our archives, we found some unseen video footage taken at the time from an aeroplane (drones hadn't been invented yet). There is no sound and the images are a little hazy due to the weather, but you can get a good idea of the scale of this landslide and some of the damage it caused. 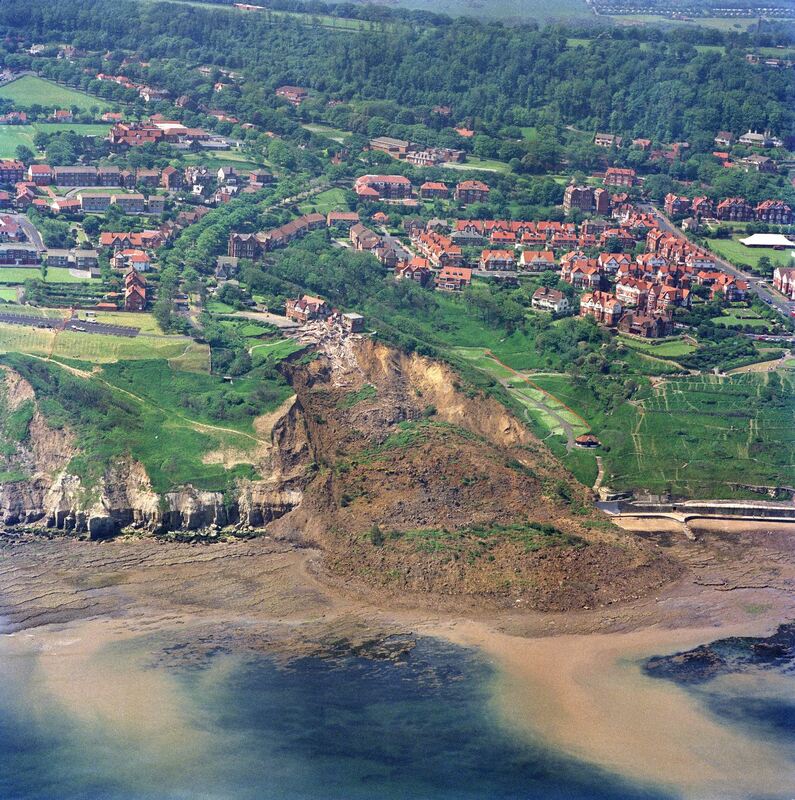 On the night of 3rd June 1993, a rotational landslide began in cliffs near Scarborough, Yorkshire, that destroyed part of the four star Holbeck Hall Hotel two days later. Fortunately, the hotel was evacuated before anyone was hurt, despite the alleged reluctance of the guests to leave, even when there was "a gaping chasm 10 m from the hotel". It involved an estimated 1 million tonnes of glacial till that flowed across the beach forming a promontory 200 m wide, projecting 135 m from the foot of the cliff. 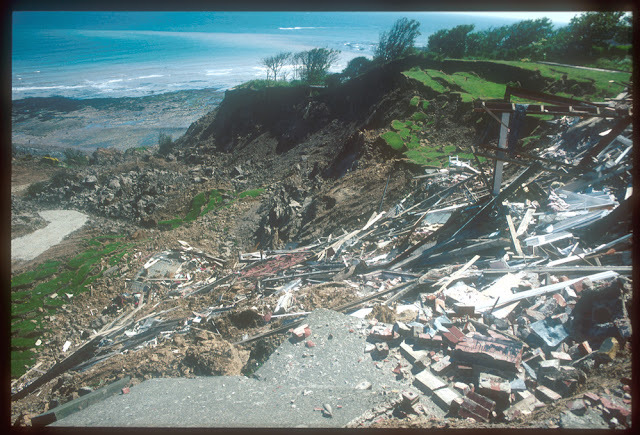 This famous landslide attracted the attention of the national and international press and has been used to demonstrate landslide processes and slope remediation to schools and university groups ever since. The coast is a dynamic, ever-changing environment and landslides of this size will have been evolving these cliffs over the last five thousand years or so, when sea level roughly reached its present position. In fact, numerous landslides have been recorded along this section of coast over the last few hundred years. One such landslide (described as an earthquake at the time) took place in December 1737 where an acre of pasture with five cows grazing on it subsided. The cows, apparently unperturbed, were rescued unharmed two days later. You can find out more about landslides along this section of coast, and elsewhere in Great Britain, in our National Landslide Database. During the development of Scarborough as a seaside resort, the Victorians regraded and landscaped large sections of cliff (including the landslides) to make public areas with gardens and promenades. They also built large hotels and private dwellings in many cliff top areas. 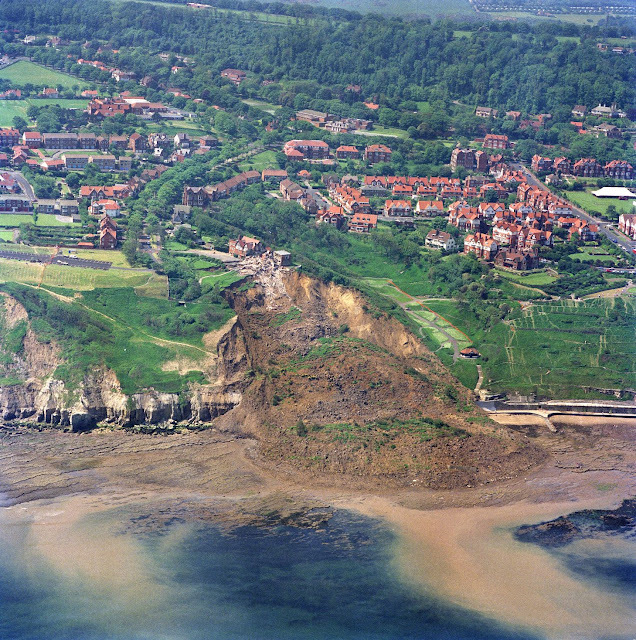 Managing this legacy has been the job of Scarborough Borough Council who, along with the North East Coastal Observatory, monitor the cliffs and landslides. They have been assessing and maintaining this coast for decades and much of their work is freely available on their websites, including a great source of data and reports. 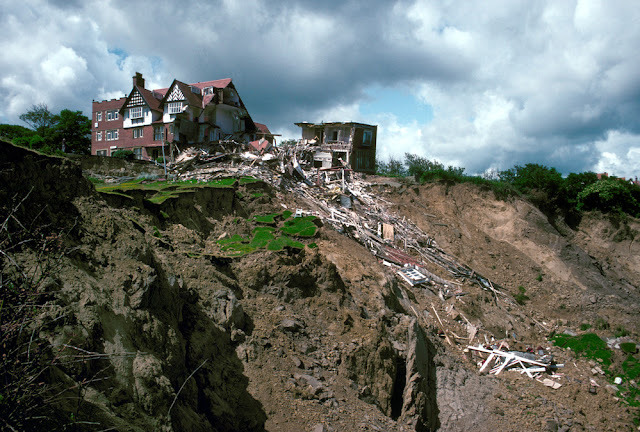 The Holbeck Hall landslide 1993. P707132. BGS Copyright NERC. 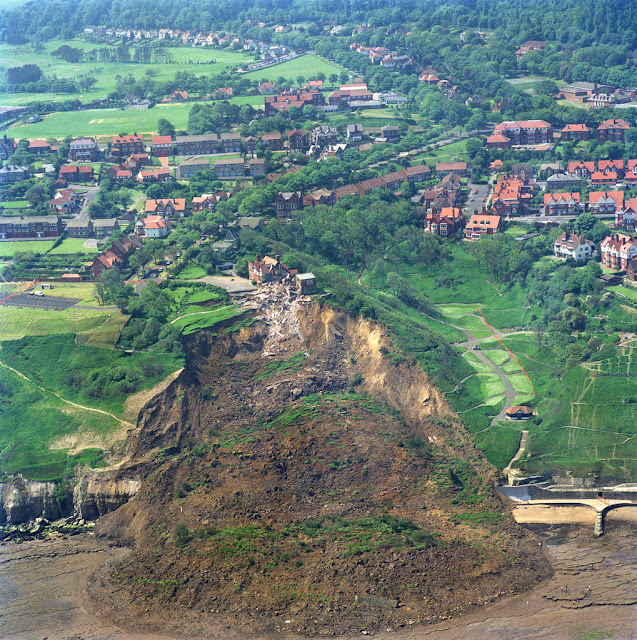 The Holbeck Hall landslide. P707131. BGS Copyright NERC. 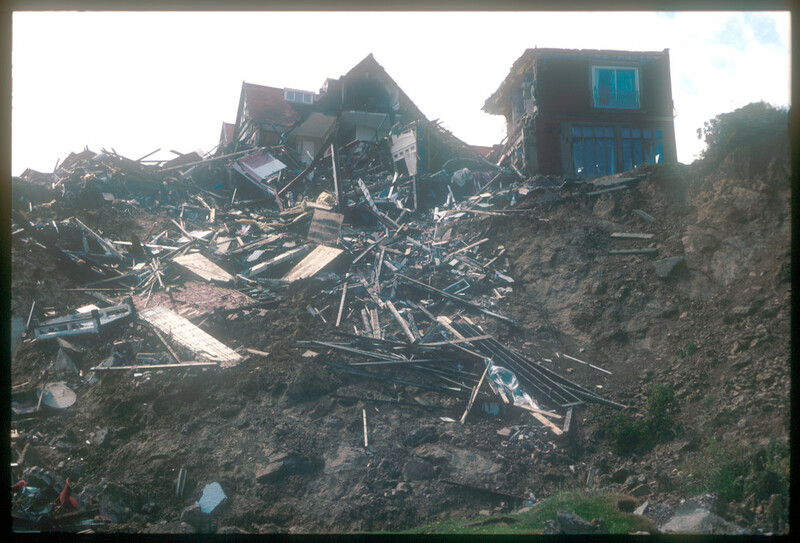 Holbeck Hall landslide. 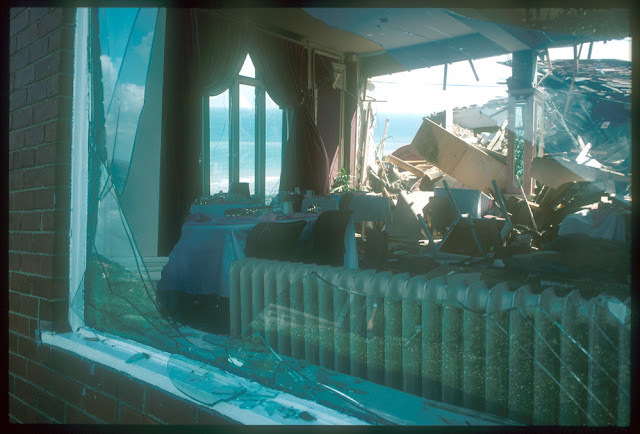 Wreckage of the Hotel, Scarborough. P509016. BGS Copyright NERC. 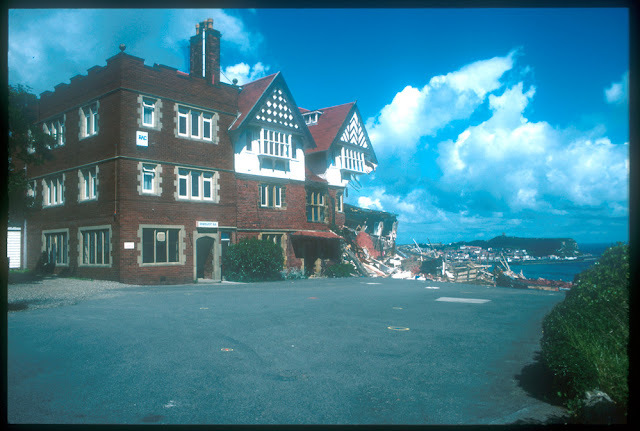 Holbeck Hall Hotel landslide, Scarborough - Damage to hotel and gardens. Extensional features and rotated blocks. P509023. BGS Copyright NERC. Holbeck Hall Hotel landslide - damage to the hotel. P509025. BGS copyright NERC. Holbeck Hall Hotel landslide - damage to the hotel. P509027. BGS copyright NERC. Holbeck Hall Hotel landslide - damage to the hotel. P509028. BGS copyright NERC. 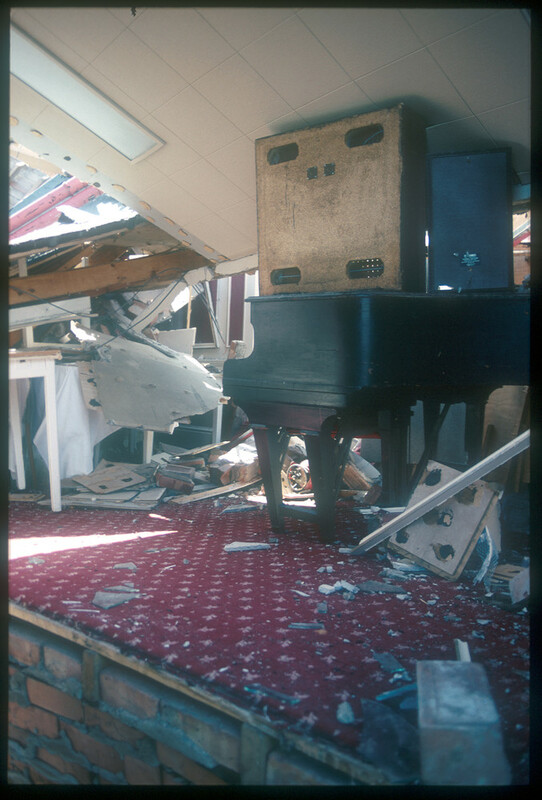 The damaged Holbeck Hall Hotel after the landslide. P509209. BGS copyright NERC. The damaged Holbeck Hall Hotel and landslide. P509030. BGS copyright NERC. 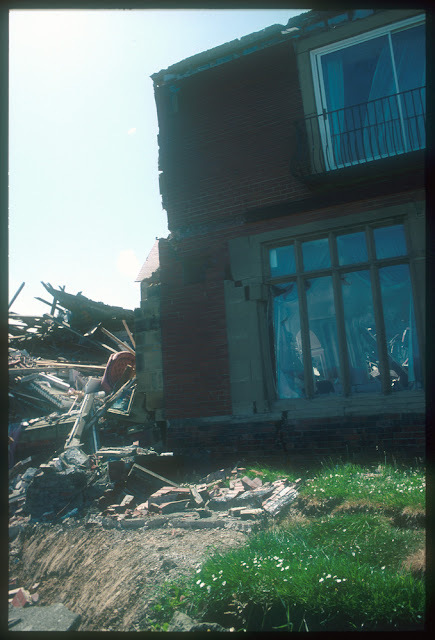 The damaged Holbeck Hall Hotel and landslide 1993. P509049. BGS copyright NERC. Clements, M. (1994). 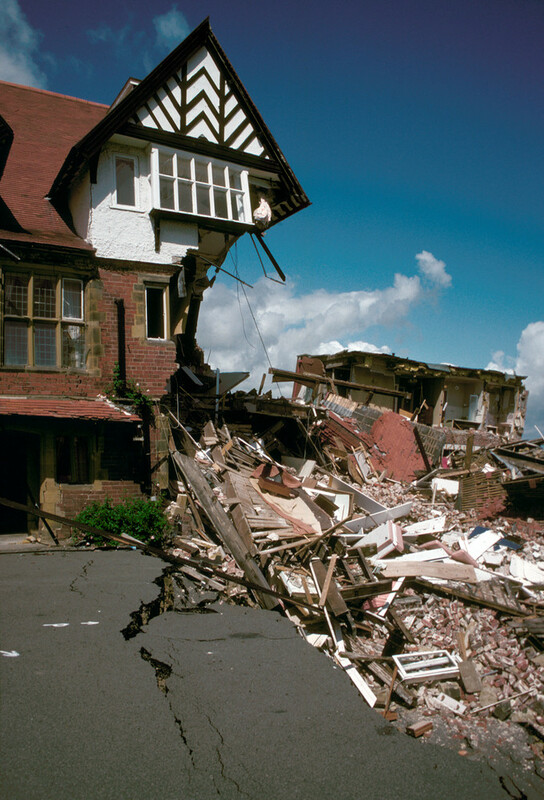 "The Scarborough experience - Holbeck landslide, 3/4 June 1993." Proceedings of the Institution of Civil Engineers, Municipal Engineer 103(June): 63-70.